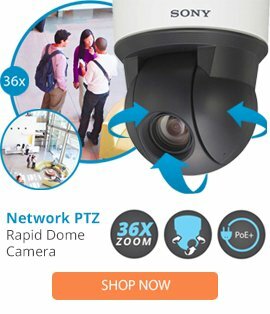 The Sony 7" Vandal Resistant Dome Housing protects a Sony SNC-RX series or SNC-RZ25N PTZ network camera in an outdoor location from weather and vandalism. The upper part of the housing is constructed of durable cast aluminum while the lower dome is made of an optically correct polycarbonate blend material. Built into the housing is a 24VAC heater module, allowing safe camera operation in temperatures as low as -20°F (-29°C). A continuously operating blower keeps the dome from fogging up in high humidity. An internal camera power adapter eliminates the need to run two power cables to the housing. The dome on this housing is clear to allow maximum light transmission.